Oo-ar me hearty! 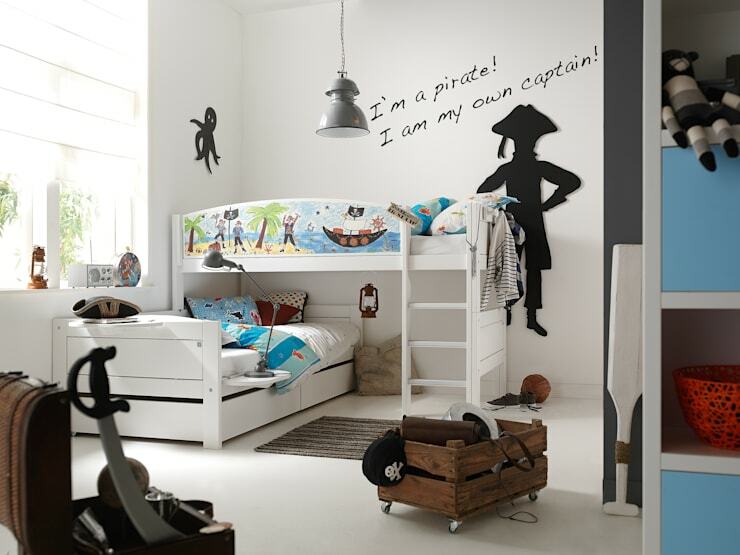 Create a swash-buckling room any Jack Sparrow would be proud of with these pirate themed products. 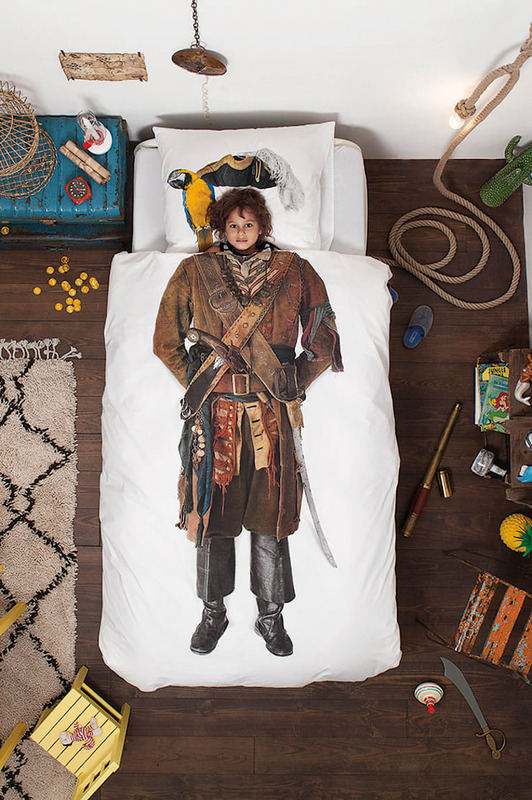 Snurk Pirate Duvet Bedding Set is perfect for all little boys who dream of being a pirate. The pirate suit was borrowed from a film & theatre costume designer in London. This bed linen set will enable them to transform themselves into a pirate and embark on their own adventures in dreamland. This luxury children's bedding set is the perfect gift for for all little & big boys. This duvet set gives you a chance to become your very own pirate ready to to aboard the ship, off looking for treasure! Also available in Double Duvet Set. Please contact us on 01305 231231 if you wish to special order this duvet set in Double. Raise the anchor and ready the men... 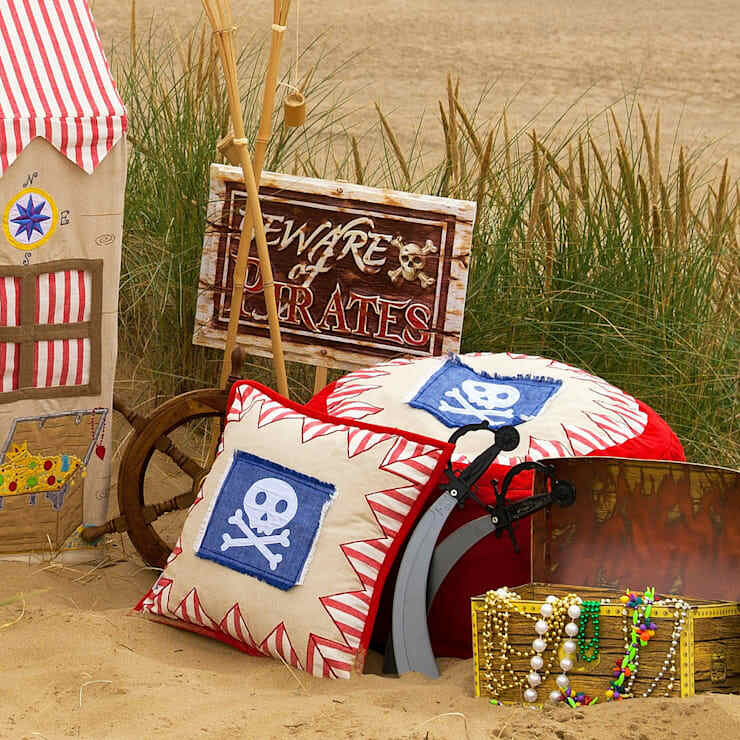 The New Pirate Shack Cushion Cover by Win Green. A fabulous kids bedroom accessory.This Cover with Skull and Cross bone design is a great accessory to match the Pirate shack playhouse and sets the scene for your little pirates to embark on a swashbuckling adventure.This will look great on the bed as well us used inside the playhouses.A unique gift for boys that will be sure to keep play time a happy time! Measures: 42cm x 42cm. NOTE: Filling Sold separate. There are also other accessories available in this range. ["TR"] [Published] Bir çocuk odası nasıl güzelleştirilir? Kopya çekebileceğiniz 6 örnek! ["IT"] [Published] Stickers per bambini, per una cameretta piena di fantasia! ["EN"] [Published] Awesome themes to make a statement in your home! Part of our range of Designer Kids Beds. The Pirate boys L shaped bunk bed is a fun bed that comes complete a high bunk with pirate detail, ladder and a low bunk with under bed storage. This can be used to make a third guest bed. This unique boys bed is made from the best solid knot free pine and hand crafted in Denmark. Safe and also beautiful, It features a whitewash finish applied on the solid pine, to preserve the natural beauty of solid wood, treated with a combination of lacquer, wax and pigments. You can also place a mattress under the bunk so it can be double up as a play mat or second guest bed. Features and benefits:Made from knot free Scandinavian Pine from certified and sustainable forest.Hand crafted in Denmark.Includes pirate design.Includes ladder.Includes under bed drawer.Open bottom (73cm height).Measures: Total Height 210cm x Length: 207cm x Depth: 102cm.Mattresses not include.Excludes clip on table (sold separate).Excludes coat rack (sold separate).Excludes name plates (sold separate).Fits mattress size: 90 x 200cm.These unique children's beds are hand made to order, please allow 6 weeks for delivery.Optional Extras: Clip on table: £55.Coat Rack: £55.Personalised Name Plate: £50.90 x 200 x 20cm Body comfort mattress (British Made, high density quality reflex foam): £23090 x 190 x 12cm Trundle Matress: £230. These unique kids beds are made with robust joints, excellent stability, non-toxic paints to ensure safety is put first at all times. Raise the anchor and ready the men... The New Pirate Shack Playhouse by Win Green. 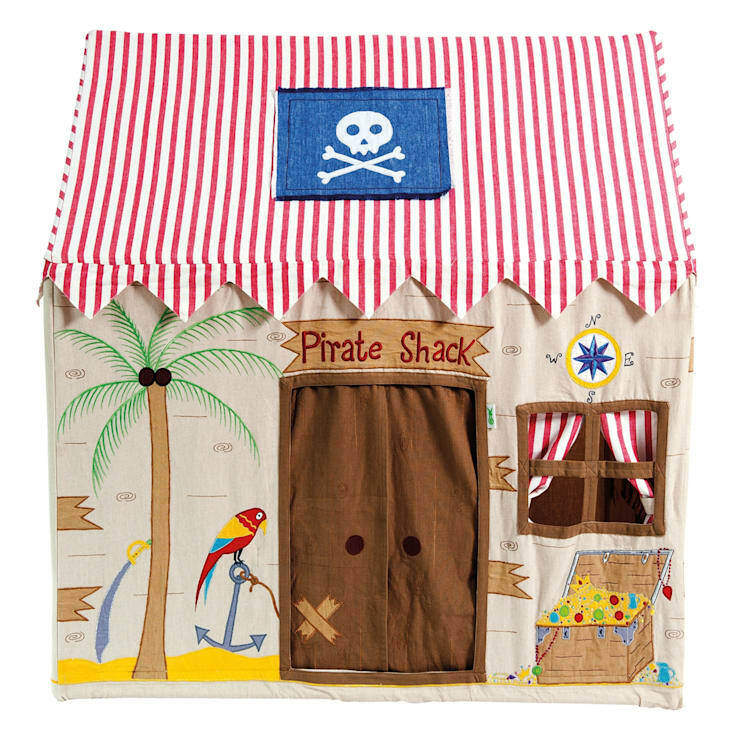 A fabulous kids bedroom accessory.With an embroidered compass, friendly parrot and chest of bejewelled treasure, our Pirate Shack sets the scene for your little pirates to embark on a swashbuckling adventure.A unique gift for boys that will be sure to keep play time a happy time!It's easy to assemble with a light metal frame and storage bag include. This can be used as a children's indoor playhouse and as an outdoor playhouse.Available in 2 sizes:Small: 110cm long x 74cm wide x 110cm high.Large: 134cm long x 110cm wide x 165cm high. There are also matching floor quilts and other accessories available in this range. The Captain bed is a truly unique children's bed and part of the Captain collection of kid’s furniture. 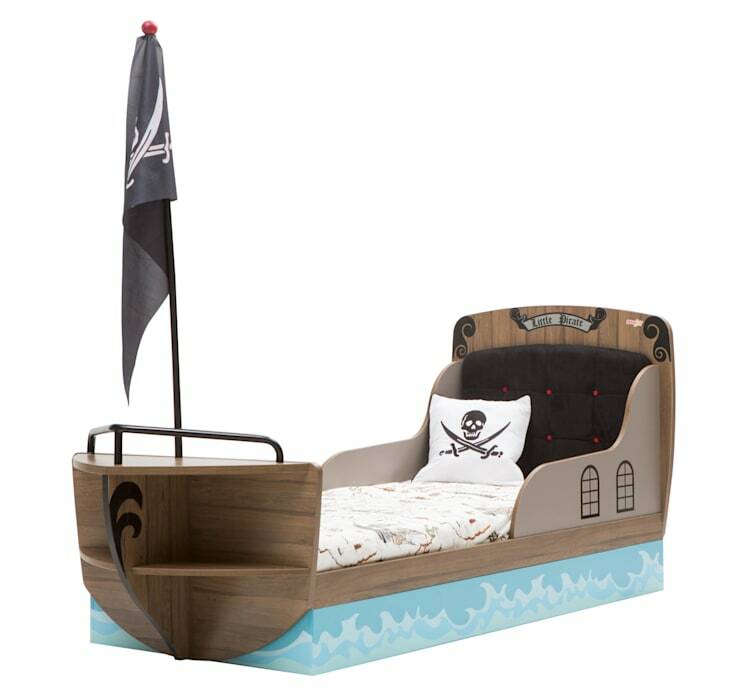 This bed combines unique looks, outstanding build quality and luxurious finishing creating a bed your little pirate will love. Features and Benefits:Carefully designed and manufactured to offer the ultimate in style, quality and safety. Detailing which has been applied with the latest 3D and UV printing technology. The pirate children’s bed frame is also easy to clean and will not be damaged by standard household cleaning agents.Made with high grade (E1) MDF and 2mm PVC layer to all edges and corners. Sizes: Height: 115cm Width: 99cm Depth: 215The padded headboard is both comfortable and supportive, ideal for children who like to read in bed. The mattress is not supplied with the bed frame but available.Sizes: Height: 109cm Width: 105cm Depth: 209cm. With a wide selection of children's bedroom furniture available in the Captain design you are sure to be able to create the perfect bedroom for your little one. Check out our amazing collection of boys beds here. Our furniture is available for international shipping, please call 01305 231231 for a quote. Adventure starts in the bedroom with the stylish boys wallpaper in a classic theme. This wonderful Pirates Seas wallpaper featuring island strongholds and high seas full of galleons, seas monsters, shipwrecks and the mysterious kraken. 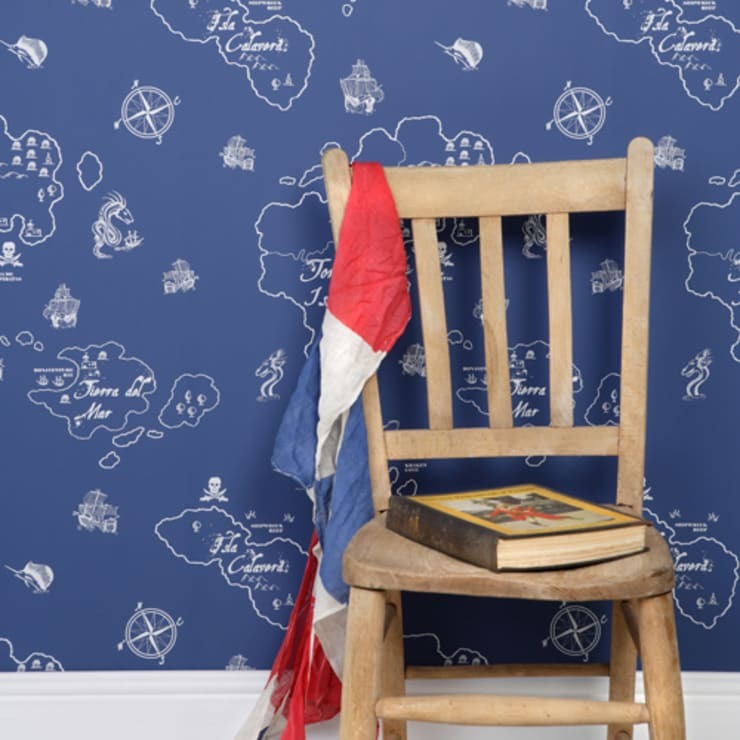 This children's wallpaper is inspired by sea charts of old, this wallpaper mural embodies excitement, risk and adventure – three elements children love to explore.Fabulous for creating a statement wall, we’re certain our Pirate Seas design will be the talking point of any room. Available in two stylish colourways: White on Marine Blue and Black on a Gull Grey. Roll width: 52cm.Roll length: 10 metres.Pattern repeat: 64cm half drop. 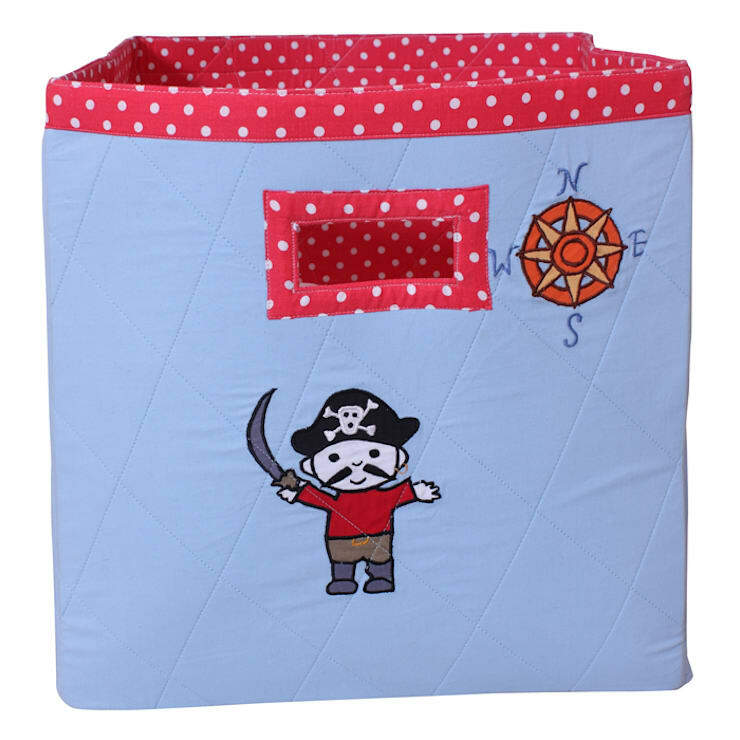 This beautifully made appliqued, Pirate fabric storage bag is made from padded and quilted 100% cotton fabric. This practical storage bag is reinforced at the bottom and completed with two carry handles. Features and Benefits:Very pretty appliqued Pirate designVersatile storage bags are suitable for storing everything from toys to books, laundry and more. Ideal for picnics, days trips and family holidays.Sizes: Width: 39cm Length: 39cm Height: 29cm For international shipping, please call 01305 231231 for a quote.